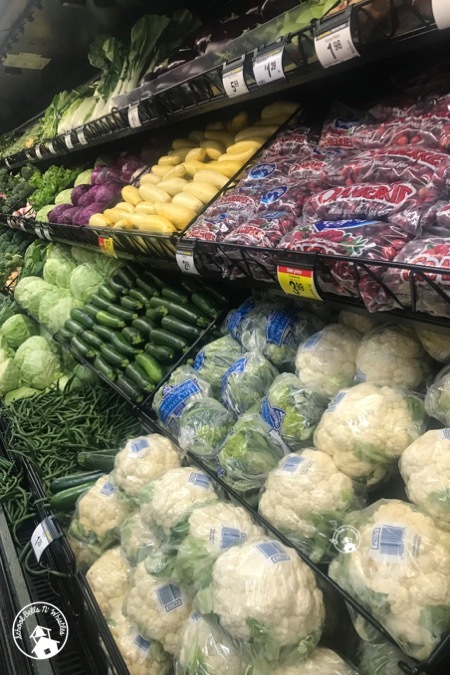 SETTING UP A SCHOOL GROCERY PROGRAM! If you teach special education at the secondary level, then you likely have Community Based Instruction (or CBIs). What I love about CBIs is that students experience REAL LIFE learning! For my middle school special education class, my favorite CBI was going to the grocery store, but I always felt it needed more. I came up with a SHOPPING PROGRAM for our school. We would shop for members of our staff. It was amazing! Our administration loved it and so did the teachers! Nobody wants to go to the grocery store after working all day. And if you are like me, you finally decide what to make for dinner and then realize you are missing ONE item! With this program our kids went shopping for the staff and then delivered the items at the end of the day. We would buy just about anything (within reason). It can even be something as simple as a soda or pack of gum to keep in the teacher's desk. 2. PRACTICE GROUP - Choose a group to begin with. I would recommend starting with a smaller group for practice. Our first "customers" were the administration which was about five people. Keep in mind that you will need to carry the items back to school. Our store was within walking distance and I'm in Las Vegas so weather is not an issue but many classes use buses for transportation to CBI's and weather may be a factor. I would suggest using sturdy grocery bags (cubes) such as these. These bags are super easy to carry. I found them on Amazon. Since we walked, I used our SPED money to buy a grocery cart which was super helpful! 3. 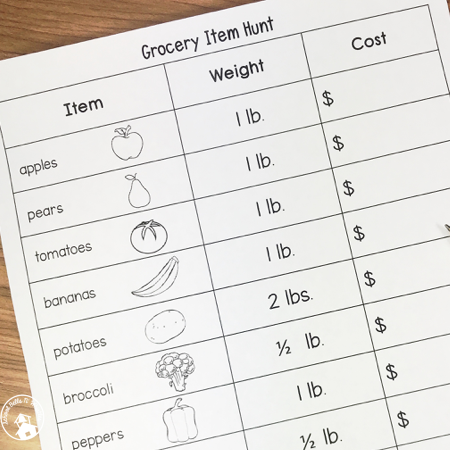 DELIVER LIST - Hand out the Grocery Shopping list and explain that they are not only getting some items delivered, but that they are also really helping your students practice a valuable life skill! Really it's a WIN-WIN! I made to sure to hand out the list a few days in advance but not TOO early either. Give them a day or two to bring some cash in. I chose to set up our program using only cash but if you have the means to use another method that's up to you. I wanted my students to practice using money. 4. COLLECT FORMS AND MONEY - Collect the forms and the money. I recommend stapling an envelope to each form. 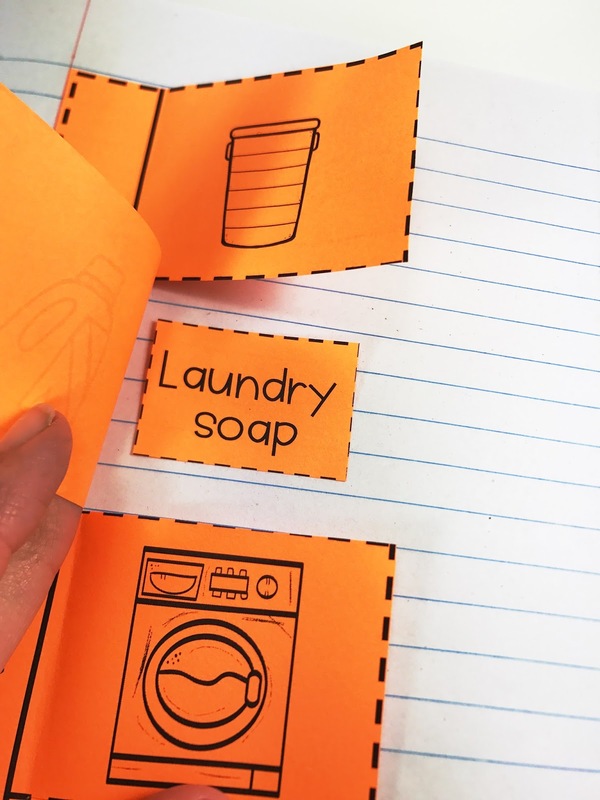 Write the name on the shopping list as well as on the envelope in case they get separated. Also, write the amount of money in the envelope. 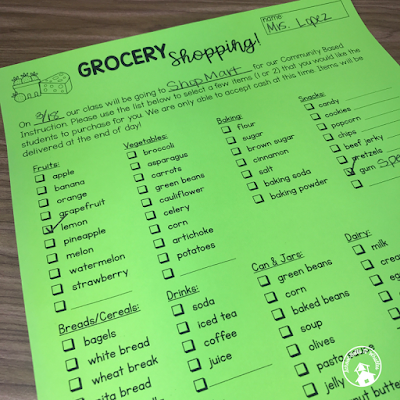 5. REVIEW LISTS - When you get the forms back, spend a day or so going over the items with your class BEFORE the grocery trip. 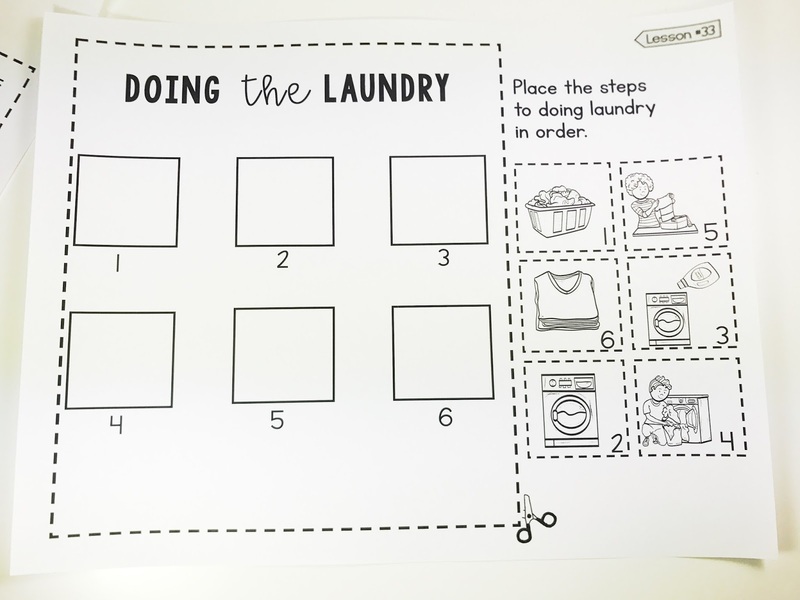 As a group, we googled images of the items that were on our list and printed them out. This is helpful for your visual learners who may not be reading. We then glued the images on a page. 6. GROUPING - Decide if you want to go as one large group or split up. Based on my class size of 14 and because I had an additional adult, we split up into 3 groups. If you split up then you can divide the lists. You can also separate the lists based on ability, so you could give some students more items to shop for than others. 7. VOLUNTEERS - If you can, ask some of your related service providers to attend. I had our speech pathologist and OT come along. They were in the same group as some of their students and were a tremendous help! Just make sure you give them enough notice! 8. NOTIFY STORE - This is totally optional, but I let the store know in advance we were on a CBI and that we would be practicing life skills. They were always super friendly and accommodating. 9. SORT AND PREPARE FOR DELIVERY - When you get back to school, make sure you put any change in the envelopes for each customer. ***After you do your shopping and return back to school, you can have students deliver the items. I would usually send one or two students along with staff (if they needed assistance). This the form that I used to hand out to our school staff. You can find this FREE GROCERY FORM HERE. You can grab this form and a few other FREE forms such as the one below here: GROCERY SHOPPING CBI. Our school staff really LOVED this program! They were happy to help and it was an excellent LIFE SKILLS practice opportunity! Are You Prepared for the New School Year? If you've been teaching a while, you probably have a pretty good routine in place, but I feel like there is always something I can "do better next year." Even after starting the school year multiple times I always tell myself, "Next year, I'm going to to do this.....!" 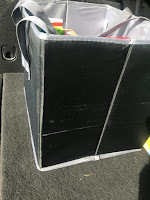 Here are some things I have done to help prepare for what always seems to be a hectic time of year, with new kids, and sometimes a new grade level or school. Once you get the IEP (ideally BEFORE school starts) complete the IEP SNAPSHOT. It helps to really solidify those key components. 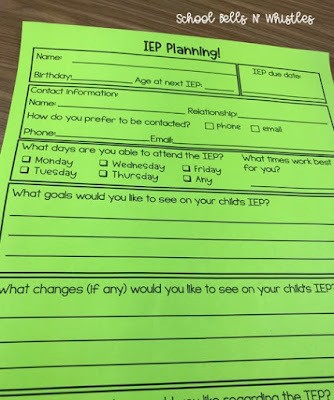 When you fill it out, it also helps you get to know your student's IEP. 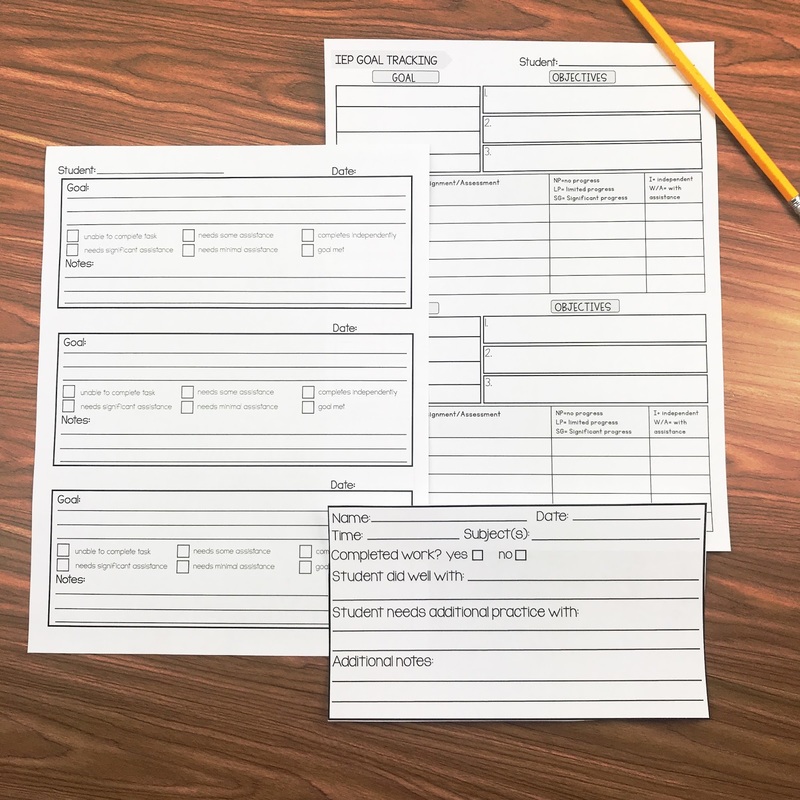 You can also make copies for other staff who directly work with your student. 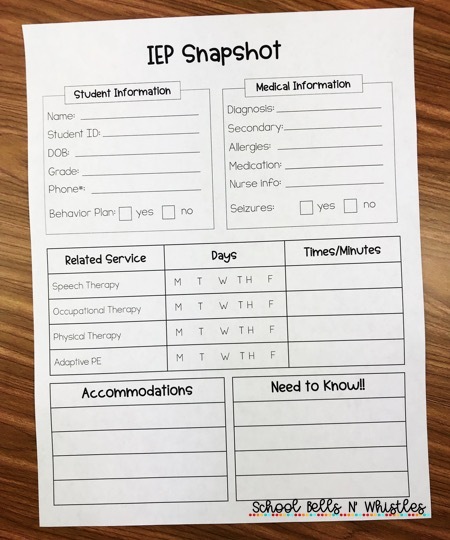 You can get a copy of the IEP snapshot here. Another thing I like to do is send home a PARENT QUESTIONNAIRE. I love to gather more personal information from those who really know the student best! 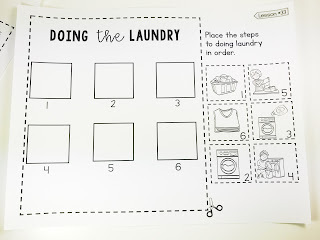 This will help also help you in gathering items to use as reinforcers. You can also get this in my FREE BACK-TO SCHOOL SPED FORMS. I don't know about you, but sometimes I feel like scheduling the IEP takes longer than writing it! 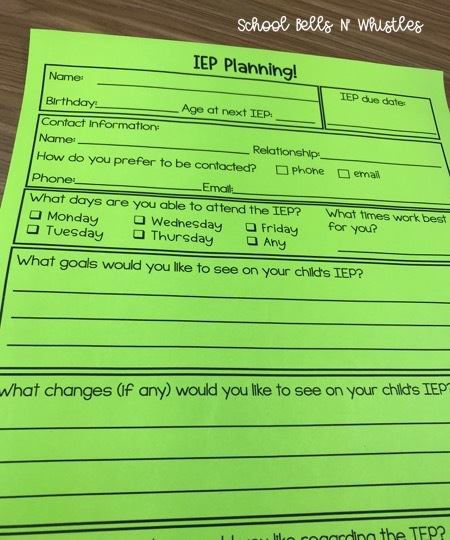 I created this form to help with the IEP planning. I can also use this information when working with the other IEP team members to set up a time and day that works for everyone! You can also get a feel for what the parent is looking for in the IEP and be prepared for any possible revisions. I think one of my worst fears is putting a student on the bus when they were supposed to get picked up! I made these backpack tags so that anyone who is with the child will know how they are supposed to go home. So helpful when you have non-verbal students or if you teach Early Childhood. It's also great when you have a sub. My para also wore a lanyard around her neck with a mini list of student names and bus #s. You can also add BUS# and WHO is allowed to pick the student up. 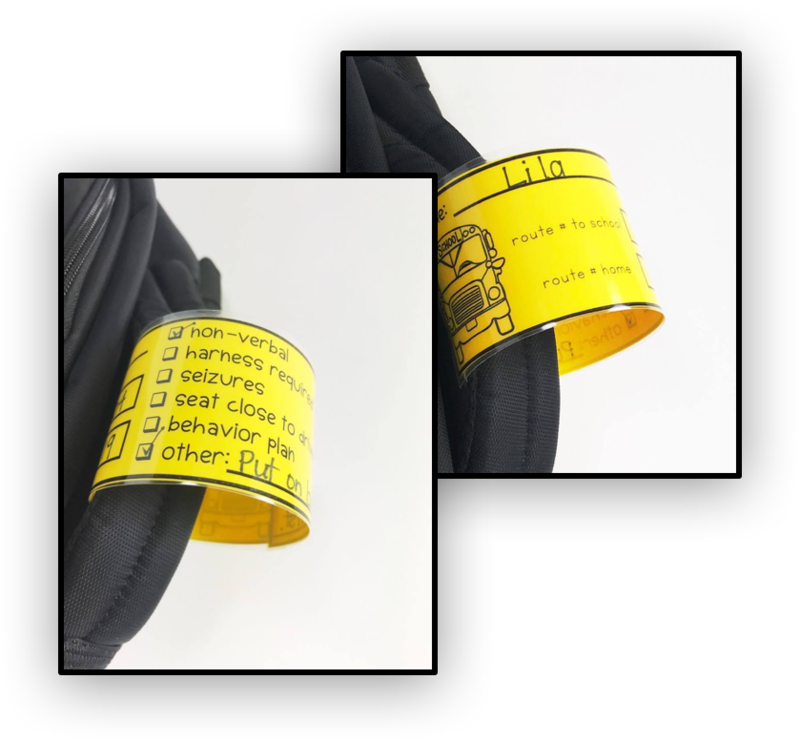 These are also part of my FREE back to school set. Of course there are many other items to prepare for the beginning of the year, but hopefully these few items will be helpful to you in starting the year off! If you are looking for ideas to help you set up DATA FOLDERS in your classroom you can find some information HERE on an earlier blog post. Allergies are serious! 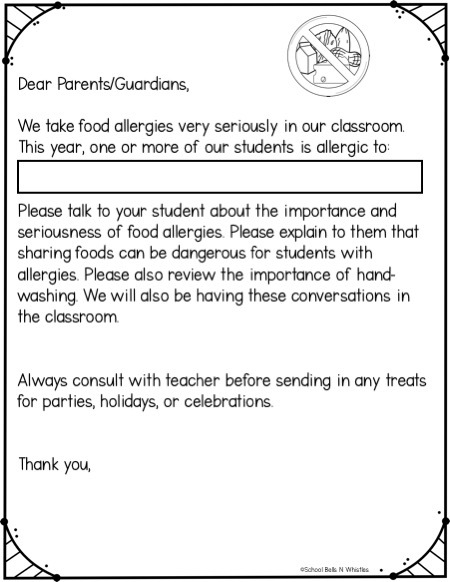 I write this post as both a teacher and a parent of a child with a serious food allergy. My daughter was given the very food she was allergic to more than once at her previous school! She was two and three years old and not able to advocate for herself. It's a very scary thing to see your child with hives or facial swelling. 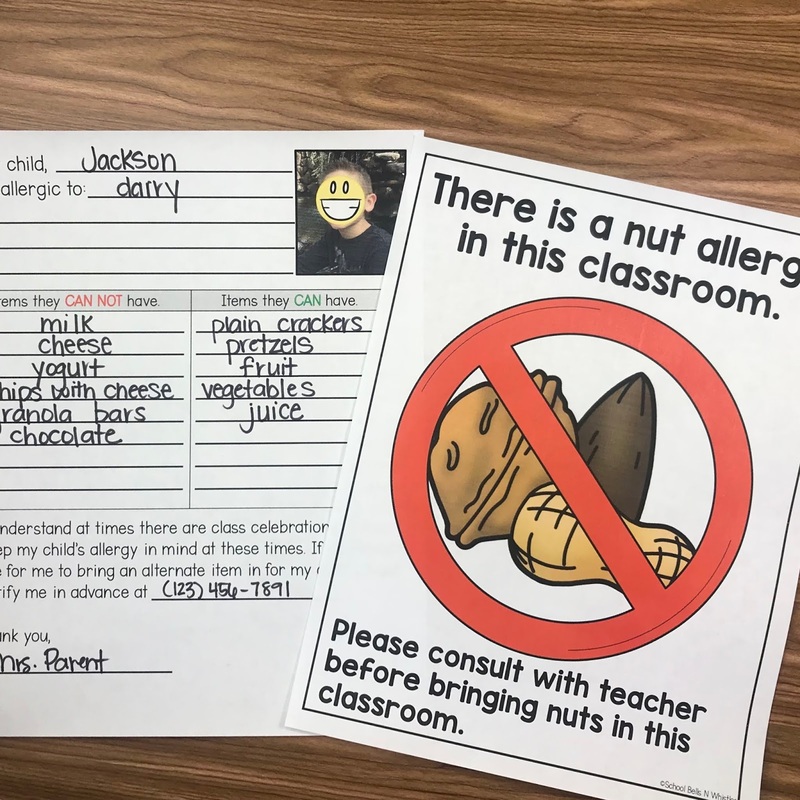 There has been a significant increase in allergies, so there is a very good chance you currently have or will have a student with a food allergy in your classroom. 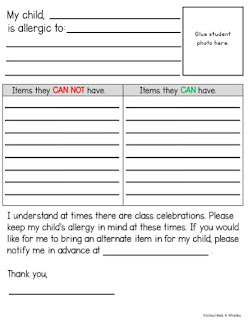 I'm including some tips below and even more on the FREE STUDENT ALLERGY FORMS you can find in my store. 1. Communicate with parents. Get as much information as you can. Use the PARENT FORM I've included to not only determine what the food allergy is, but also get some examples of food items that may contain this item. There are hidden ingredients in many foods. Never assume. Always check labels. Parents will also be able to provide a list of items that are safe for their child. Communicate with the school nurse as well and discuss epi pen procedures. 2. Educate yourself about the allergy. My daughter is allergic to dairy but a baked potato chip sent her to the emergency room. Yep! Who would have thought that a baked potato chip would contain dairy? I sure didn't, and I check labels on everything. Turns out it was covered in whey protein. Lesson learned! Chocolate also contains milk, which most people don't realize. Again, never assume. For some of our kids, even trace amounts of a food can result in a serious life-threatening reaction. 3. Make sure ALL school personnel are aware of the allergy. YOU might be diligent, but others may need reminders. Two of the times my daughter's allergy was ignored was with a sub. That is not an excuse. The school should have a system in place in the absence of the teacher. 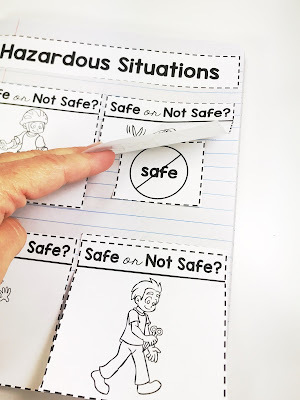 A student shouldn't just be safe most of the time, they need to be safe ALL of the time. 4. 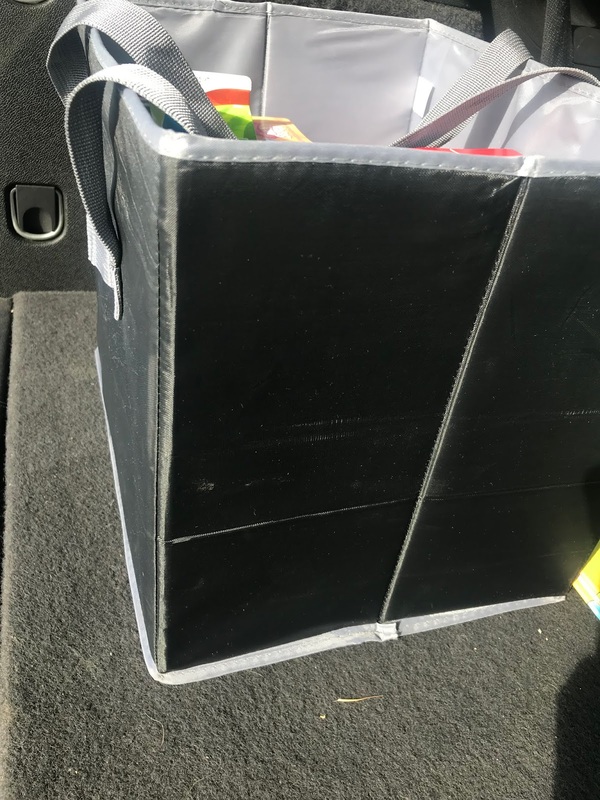 Make a "SAFE SNACK BAG" for the student and keep it on hand. Ask parents to provide some safe snacks so that in the event a snack is brought to school that is not safe for them, you have a back-up. 5. Talk to your class about allergies. There are many books and even some great FREE educational videos on allergies. Have an open discussion. 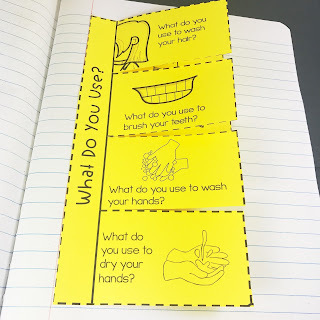 Teach them about not sharing food, washing hands, and what to look for if a student is having a reaction. Keep the nurse's extensions right next to your phone and let your students know what to do. 6. 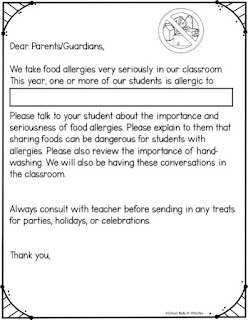 Send home a parent letter letting them know there is an allergy in your class. 7. Explain to parents that they need to consult with the teacher prior to bringing foods into school. 8. 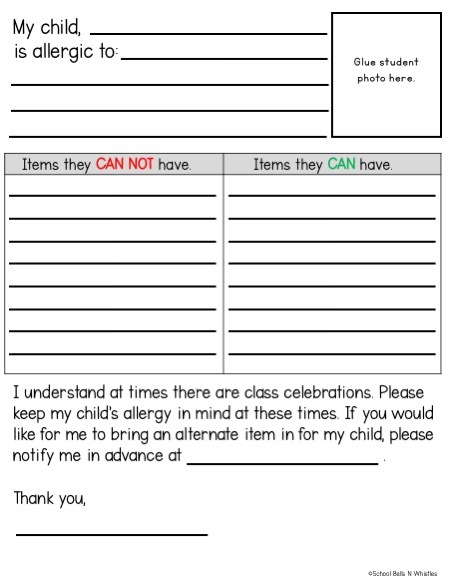 When you have a class party or celebration, consider the allergies in your room. Don't let one or two kids have to sit and watch the rest of the class enjoy a treat that they are unable to eat. Think of alternatives ahead of time and check with parents. I bet they would be happy to bring something in or help come up with ideas of treats that all of your students can enjoy. Be prepared and ensure your classroom is a safe place. I hope these forms help! Please note: These are only suggestions as you should always follow your school or district policy regarding student allergies. 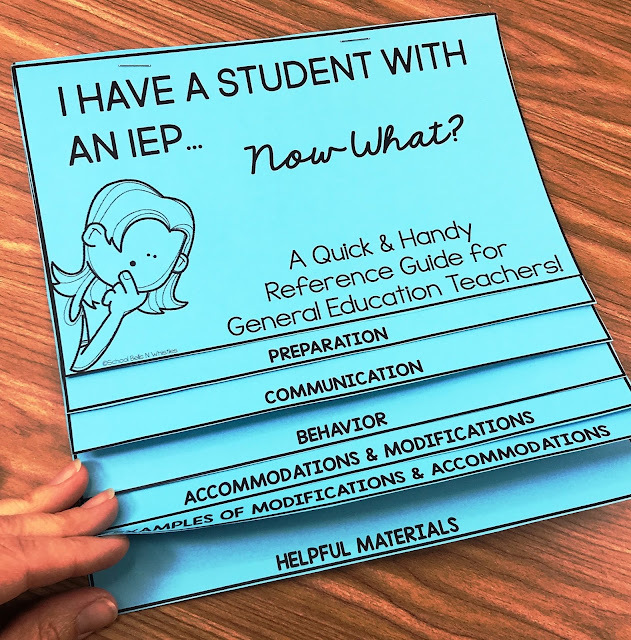 Are you a general education teacher who has a student with an IEP? Are you a special education teacher that has students who spend part of their day in the general education environment? It doesn't matter what kind of teacher you are, ALL teachers are busy! Throw in a few IEPs, adapting materials, goal and data tracking and things can get overwhelming. It may always be busy, but you don't have to feel so stressed out. 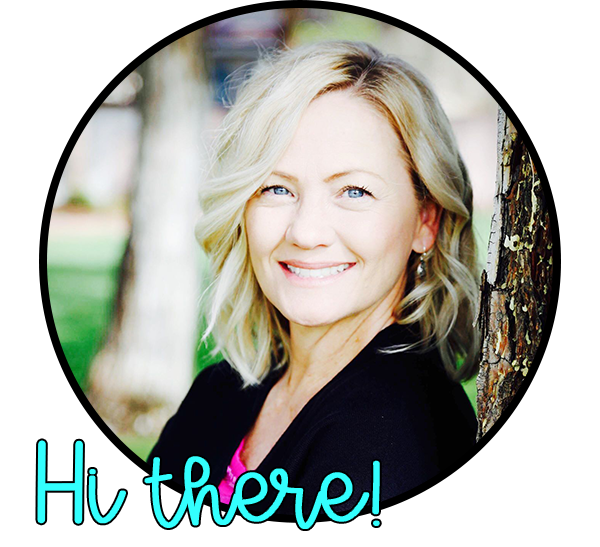 I've put together some helpful information (AND A FREE FLIP BOOK) to hopefully make your year smoother, more organized, and more effective! 2. BE PREPARED! Read the IEP and transfer some of the key components onto the IEP AT A GLANCE. (I've included a free one in this set). Create a folder. Include the IEP at a glance, goals, accommodations/modifications, data sheets, and materials to assess the goals. I pre-fill this folder at the beginning of the year which will save you so much time later! For example, if a student has a goal to write their name, I will fill with name-writing templates. I write the date next to each sample. When it's time to write the IEP I have all of the up to date information I need. You may also want to do some of your own assessments if you think students' present levels are not matching the IEP, especially over summer break when often students do not retain information. It's good to know where you students are exactly. 3. COMMUNICATE. Meet with the IEP team frequently. Stay up-to-date and share relevant information. Discuss what is or is not working and any possible revisions. They may have information that can help you. Don't wait until you are frustrated. 4. COLLABORATE. Don't feel like you are alone. If you are the general education teacher, Let your SPED teacher know what you are working on. They may have materials for you or they can assist you in making any adaptations. Let them know about any upcoming events, lessons, field trips, etc. 5. ATTITUDE AND EXPECATIONS! This one is huge! Students in special education CAN learn. It may be at a different rate and in ways you are not familiar with, but they ARE capable of learning. It is up to us to create equal opportunities for ALL of our students to learn. Keep expectations high, but realistic. Never assume. Make sure your student is included and is an active member of your classroom. If a student is in a corner with their aide, they are not really getting their general education minutes. 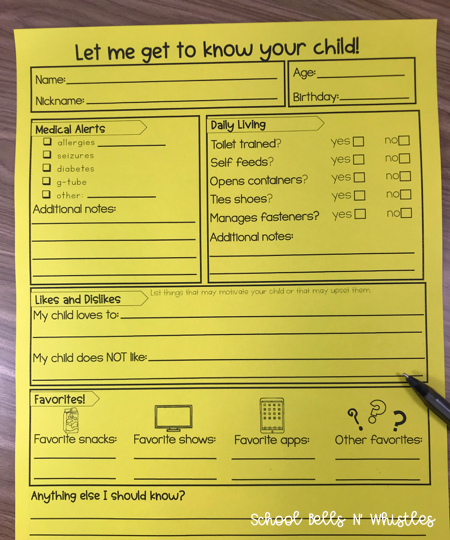 There are also some goal tracking forms, a parent introductory note, and a daily communication page. 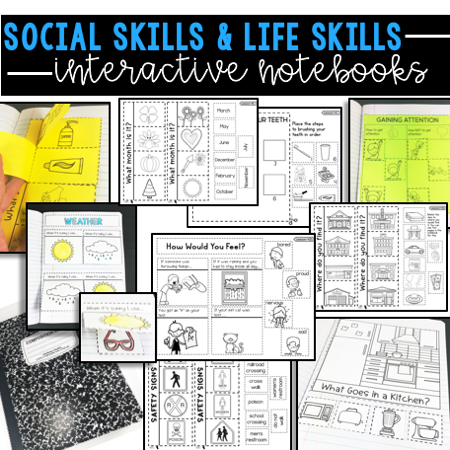 Life Skills & Social Skills Interactive Notebooks! Dozens of topics are covered! Take a peek! Something I really LOVE about this book is that students can refer back to lessons at any time. It's also a great item to send home at the end of the year or to review with parents! All cut-lines are straight and easy to cut!